Why are we as consumers so captivated by stories of great customer service? Perhaps it is because they serve as a much needed reminder that there are companies (and amazing support reps) who still care about their customers. Every company says that their customers are their #1 priority, but stories show us that many businesses are ready, willing, and able to go the extra mile for each and every one of their customers. We agree, and throughout the rest of this guide, we’ll take a close look at some memorable stories in an effort to highlight those businesses who “walk the walk” when it comes to delivering the kind of service that wins a customer over for life. Along the way, you’ll find insights for your own business to consider and some exceptional inspiration to pass on to your support team. A rigid attitude might just be the antithesis of great customer service. 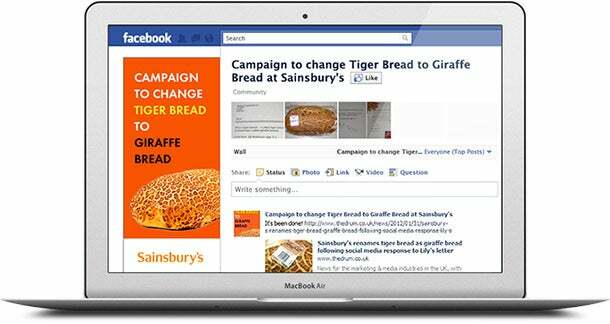 Proving that they’re a company that knows how to have a little fun, this next story from Sainsbury’s supermarket highlights how your support team should spot great opportunities to do things that are quirky and out of the ordinary. Lily Robinson (who insists that she is three and a half years old) was quite confused by one of Sainsbury’s products called tiger bread. In her eyes, the bread didn’t resemble a tiger at all, and in fact looked very much like a giraffe. It's hard to disagree with her! With a little assistance from mom and dad, she wrote a letter to Sainsbury’s customer service department. Lily’s mom enjoyed the letters and ended up posting them on her blog. 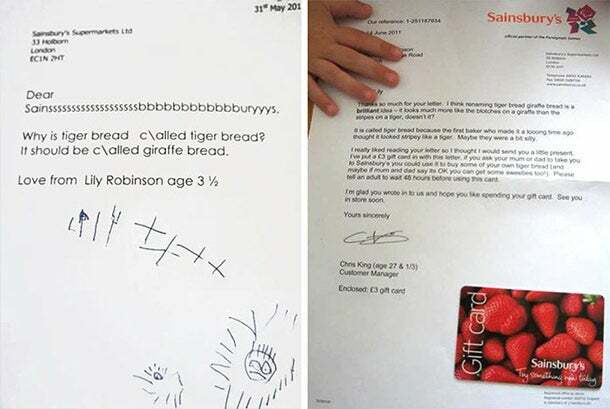 Before long, this cute correspondence was a viral hit, and the pressure was on for Sainsbury’s to change the name of the product to the much more appropriate giraffe bread. Knowing the customer was certainly right in this instance--and spotting an unusual opportunity to do something fun--Sainsbury’s changed the name of the bread and put signs around their stores that give a humorous nod to Lily’s original idea. It doesn’t take a slew of consumer data (although we’ve shared plenty of it) to support the argument that your regular customers are your rock. As such, taking care of them is not just the right thing to do. It’s also good for business. Consider the case of regular Gaylord Opryland hotel customer Christina McMenemy, who stayed at the resort three years in a row for the annual BlissDom conference. During each stay McMenemy found herself entranced by one of the features in her hotel room--an alarm clock that played light music; as in, the kind that you’d experience in a highend spa. McMenemy says, “You probably think I’m insane to obsess over a clock radio.” But, her rationale for her fondness for this item was that she had never slept better than she did while using it. For three years McMenemy tried to find the exact model clock from her hotel room, but to no avail. McMenemy had nearly given up hope when she messaged the company’s Twitter page during her most recent trip to Opryland. @GaylordOpryland Where can I buy this Sharper Image clock radio in my room? None in stores have the "spa" sounds & I've never slept better! 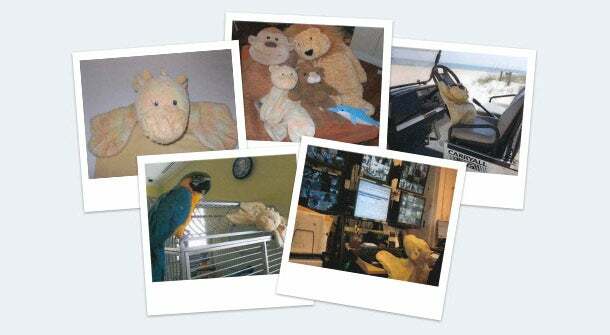 @mommystory Unfortunately, our version isn't available to the public, but here is a Shaper Image alarm clock like it: http://t.co/WkMfISSM. Resigned to her fate, she attended the conference and let the alarm clock hunt go. But upon returning to her room she was surprised to find not one but two spa clocks and a letter with her name on it. Opryland recognized an opportunity to make sure a long-time customer had one of the best experiences ever. And they didn’t just win a customer for life; they also bought plenty of goodwill with folks at the conference (and beyond) who subsequently heard about the story. The belief that you should do your best to “make things right” with customers in tough situations is a recurring theme among those companies with legendary customer service. That said, even the greats of the customer service world will have a hard time topping this next story. In another outstanding example of taking care of customers, Bungie Studios, one of the most beloved game developers in the industry, raised the bar for their willingness to take care of their fans. 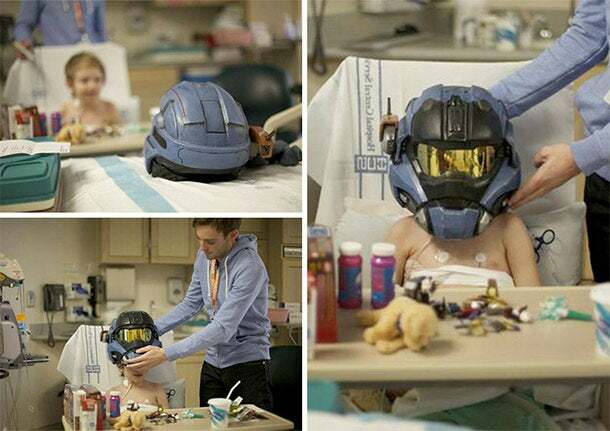 Since being in the hospital left his son unable to play the newest release of his favorite video game franchise, Halo, his dad reached out to Bungie. 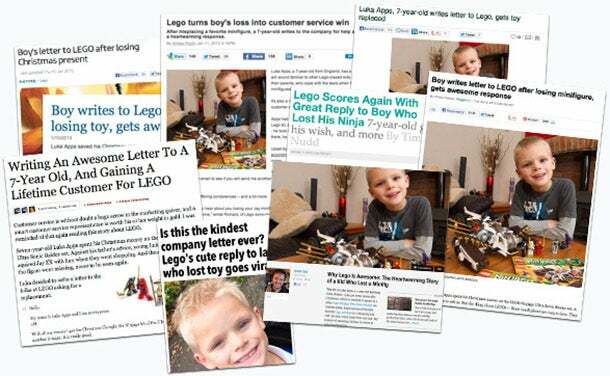 The response he received from the company went far beyond what anyone expected! First, the entire Bungie team signed and sent a card with get-well wishes. To make up for missing out on playing Halo, the team built him a custom helmet based off of the main character and sent it along with shirts, toys and custom art from the game’s designers. 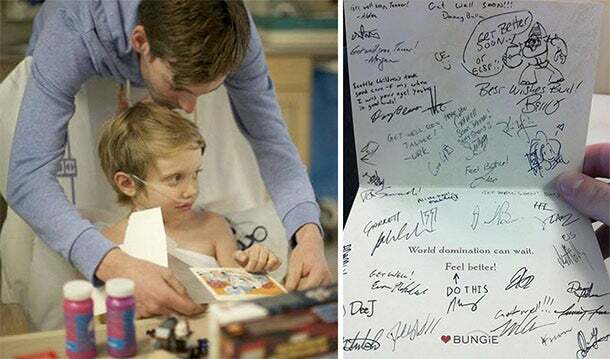 His father later posted a thank you thread and a collection of images on Christmas day, which was when Bungie visited his son in the hospital and brought the gifts. Many of the memorable stories that we’ve covered so far focus on a company’s stellar response to an usual situation ... but what about those day-to-day service stories? Superb service is not limited to out of the ordinary circumstances. It can be incorporated into the very fabric of your business, showing up in even the most common of instances. That’s why we love this next story shared by a customer in Streetsboro, Ohio. 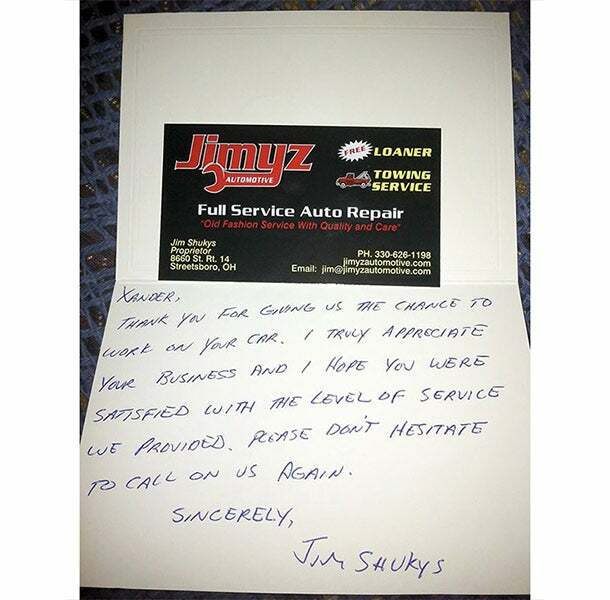 The story was posted on Reddit under the appropriately titled topic of "I have never in my life seen this level of customer service" and included this genuine, thoughtful thank-you note. Losing a favorite toy feels devastating to a young child. 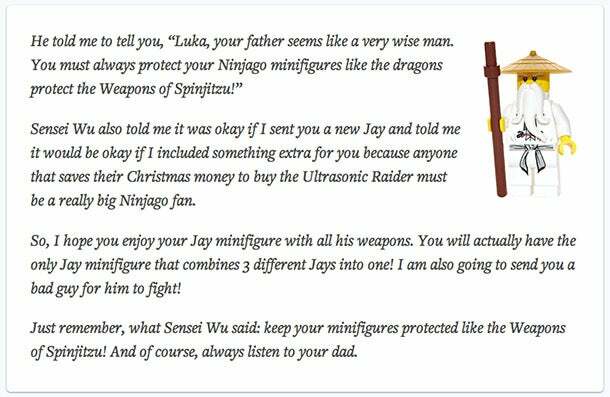 Longtime Lego fan Luka Apps spent all of his Christmas money on a Ninjago (Lego ninja) named Jay XZ. Against his dad’s advisement, he brought his Ninjago on a shopping trip ... and lost it. It’s so rare to see such a thoughtful, creative response to a distraught customer that this story went viral. An elderly man, 89 years of age, was snowed in at his Pennsylvanian home around the holidays, and his daughter was worried that he wasn’t going to have access to enough food due to the impending storm and bad weather in the area. After calling multiple stores in a desperate attempt to find anyone who would deliver to her father’s home, she finally got ahold of someone at Trader Joe’s, who told her that they also do not deliver ... normally. 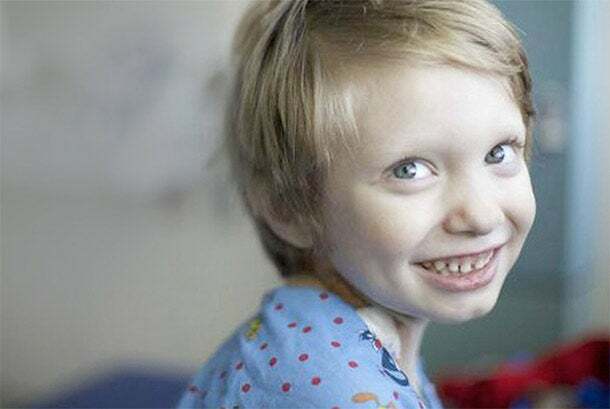 Given the extreme circumstance, they told her that they would gladly deliver directly to his home, and even suggested additional delivery items that would fit perfectly with his special low-sodium diet. After the daughter placed the order for the food, the employee on the phone told her that she didn’t need to worry about the price; the food would be delivered free of charge. The employee then wished her a Merry Christmas. 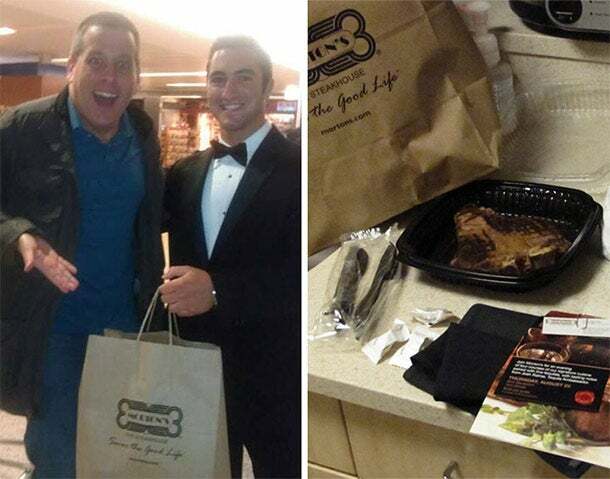 Less than 30 minutes later the food was at the man’s doorstep--for free! In refusing to let red tape get in the way of a customer in need, Trader Joe’s shows that customer service doesn’t need to be about the fanfare, it can simply be about doing the right thing. This is a fun one! It’s also a quirky reminder that many of the most fondly remembered service stories are the ones that come out of left field. This story certainly fits the bill, and it is bound to inspire you to take some extra time to surprise a valued customer every once in a while. Peter Shankman knows a thing or two about customer service. As an author, consultant and speaker on the topic, it’s safe to say his standards are high. While at an airport, Shankman realized that if he didn’t grab a bite to eat he’d be stuck riding the plane back on an empty stomach. Not one for fast food, Shankman took a shot in the dark and jokingly tweeted to one of his favorite restaurants, Morton’s, asking them if they would deliver him a steak! Even though he’s a longtime customer of the steakhouse, Shankman admits that he had no expectations when he sent out the tweet. After all, who ever heard of steak on wheels?! Oh. My. God. I don't believe it. @mortons showed up at EWR WITH A PORTERHOUSE! http://t.co/bD8k4r0 # OMFG! One of the most interesting things about Shankman’s story is that he admits that this “stunt” was meant to be out of the ordinary ... and that’s completely okay. This is a stellar example of doing exactly that, and Morton’s deserves all of the attention they received (and more) for making it happen. While great customer service stories can be a dime a dozen if you’re looking for them, you can’t help but think that some of these tales seem especially calculated. It makes good business sense to treat customers well, doesn’t it? Big companies probably aren’t hesitant to go above and beyond for customers if they suspect it could result in free press, especially around the holidays. But when you hear a tale like this, you know a business is truly focused on customer happiness. A B. Dalton customer (before the company was acquired by Barnes & Noble) was visiting the store to pick up a book requested by her son for Christmas. For the sake of not stopping the relentless pursuit of customer happiness, the B. Dalton representative actually called their competition (in this case, Borders) to reserve a book for the customer and printed out directions to where she could pick it up! While the B. Dalton team may not have made the sale that day, their outstanding commitment to wowing customers won them a repeat shopper for life. 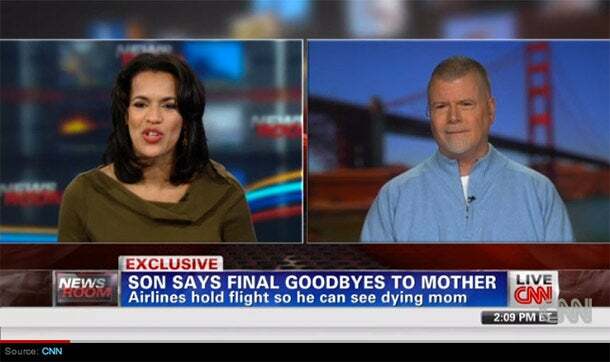 When Kerry Drake got on his United Airline flight, the mother he was en route to see was facing her final hours. To add an extra layer of dis- tress, Drake knew that if he missed his connecting flight he would likely not see her before she passed. After his first flight got delayed, Drake broke down into tears on the plane. The flight attendants soon noticed his state and quickly found out what was wrong. Within minutes, Drake’s dilemma was re- layed to the captain, who radioed ahead to Drake’s next flight. The flight’s crew responded by delaying the flight’s departure to make sure he got on board. “I was still like maybe 20 yards away when I heard the gate agent say, ‘Mr. Drake, we’ve been expecting you,’” he said. When Drake finally sat on the second flight, he realized how much went into getting him onto the plane. The result of many staff members working together to go above-and-beyond the call of duty to help this customer was that Drake made it to the hospital in time to see his mother. She died that very morning. Ritz-Carlton is one of those few large companies that is held to high standards from their consumers. With an almost legendary reputation for service, one has to wonder: Do they really live up to the hype? The story of Joshie the giraffe certainly presents a compelling case for “yes!” In case you’ve never come across this fantastic tale, the story begins when customer Chris Hurn’s son left his favorite stuffed giraffe, “Joshie,” in their hotel room after a recent stay. Mr. Hurn assured his distraught son that Joshie was just staying a few extra days on vacation. He then called the staff at the Ritz and relayed the story he had told his son. First things first: They knew Joshie couldn’t just be aimlessly wandering around the Ritz without a staff card ... so they made him one! 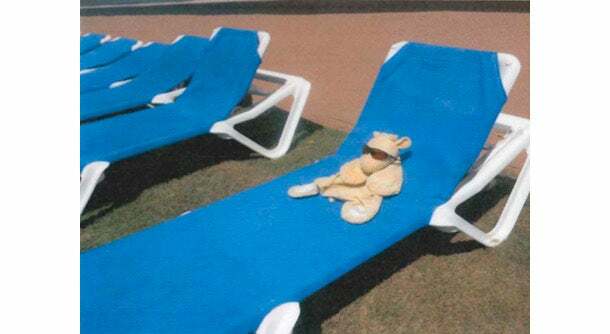 After that, Joshie headed over to the pool area to relax. Not one to sit around and do nothing, Joshie helped out in the loss prevention department. Joshie then decided to melt away some stress with a spa day. To top it all off, the Ritz sent Hurn and his son a booklet filled with information about Joshie’s stay as well as a host of pictures showing what a good time he’d had. What a story! A version of this article first appeared at HelpScout.net.